PDO::FETCH_CLASS helps to maintain the direct relation with class attribute. Basically Returns a new instance of the requested class, mapping the columns of the result set to named properties in the class. 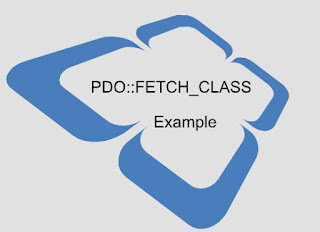 Another useful mode is PDO::FETCH_CLASS, which can create an object of particular class and no need of extra line of codes. $obj variable will produce an array filled with objects of News class, setting class properties from returned values. Lets see the complete example where we are retrieving the complete users details. //create the user class to retrieve value from database. Total Records Count : 4 . Simple class with user defined variables and functions. This class retrieve values from database using PDO::FETCH_CLASS mode. Here we are calling function to retrieve data and displaying the content in browser screen.